You will walk away from our time together with a practical roadmap that YOU will create in YOUR unique way for you and for YOUR mission. your Confidence will be supercharged. You will embrace your gifts to better serve the world with joy and avoid burnout. Ahhh. Doesn’t that sound wonderful? And we will have fun along the way! I promise. My style is combining my skill set with my innate gifts. This calls you into integrated empowerment to move you forward and expands you and your world. 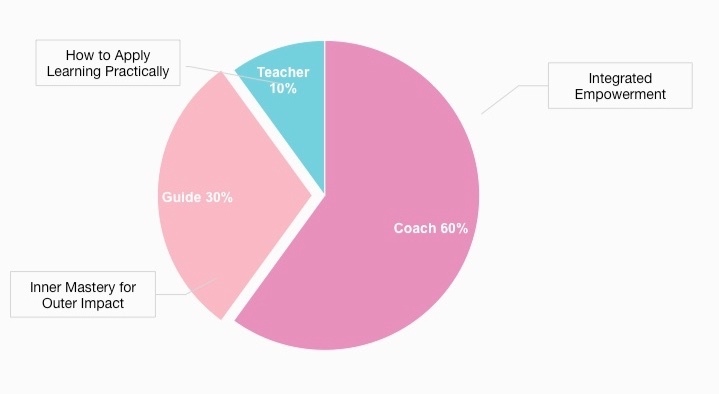 Coaching accounts for 60% of our time together while being a guide to shine light upon your amazing self and your journey is 30% and my natural sharing of what I have learned the hard way ( so you can forego the hard part and do it the easy way) is around 10%. Lots of laughter is guaranteed. Carbonated Holiness= joy, wonder, freedom, laughter, and gratitude. The possibilities of living in carbonated holiness is limitless. We create Joyful Magic together by using your ability to do deep profound work while keeping it light. Growth sometimes can be challenging to say the least. You will learn the tools you need to avoid the suffering of kicking, screaming, and being pulled to your destiny. Instead, you will grow with a free joyful heart full of wonder so you can walk, run, or skip into your desired future. I have ALWAYS had a heart for women. This allows us to connect quickly and the foundation of trust is laid so you can jump in and go go go! From reinventing myself many many times from both pain and joy I have learned many lessons. The good news is you can streamline your learning for an ease of integrated empowerment. A Haven is free of judgment. It is a place of knowing that you have your own path and that you becoming a unapologetic Divine Rebel is really TRUE liberation. You get my all of my senses used for your own self discovery. This ignites quick, deep, and lasting change to use on fulfilling your mission. Others have always been able to be truthful and tell me their secrets knowing they were safe with me. We will use this to make your exploration easier, more open, and truly honest ( and fun even). You will find that your change-making mission becomes clear and then accomplished with a free heart.